I am both excited and scared. Back in 2008, when I visited Austin, Texas for the first garden bloggers’ get together, Annie in Austin gave me a start of her Stapelia, which she had gotten from her Aunt Phyl. I’m excited to announce that after two years of growing in my sunroom, my blogalong passalong Stapelia from Annie now has six flower buds on it. This Stapelia, which Annie thinks might be Stapelia gigantea, is sometimes called starfish flower because the blooms are shaped like a starfish. I’m scared to announce that after two years of growing in my sunroom, my blogalong passalong Stapelia from Annie now has six flower buds on it. The other common name for this plant is carrion flower. It gets this name because the flowers try to mimic dead meat in both color and scent to attract carrion flies which help to pollinate it. The sensible thing to do would be to take this plant outside right now and let it bloom there. However, it is not hardy and the shock of the cool nights might be too much for it. I’d hate to lose it to some freakish early frost, which after the season we’ve had, I sort of expect. Earlier today, I started reading through a review copy of the new book Bizarre Botanicals by Larry Mellichamp and Paula Gross (Timberpress, $24.95) and was delighted to see that they included Stapelia as a bizarre plant. Must be because it tries to imitate dead meat. Apparently the authors know at least one person who was so disgusted by the scent that he took his blooming Stapelia out to the garden and buried it. I hope the scent isn’t that bad. I’m both excited and scared to find out. Since it is my sunroom, I can always close the door to that room and seal it off from the rest of the house. If necessary, I’ll do that. Or I’ll take a quick picture when it blooms then cut the flower off and throw it outside. The authors of Bizarre Botanicals, to be published in October, also noted that this is an easy passalong plant, so maybe it is time for me to take a few cuttings from mine to root and pass along to someone else? Be excited and scared, I might just offer you one! How exciting! I have one that I have had for years. It did finally bloom... I may be lucky and have one of the varities that does not smell awful! Good luck with yours! The blooms are amazing! If it is in fact S. gigantea, the smell isn't that terrible. Granted, I've only ever had one flower at a time. Six might be a different story. But I actually had to be fairly close to mine in order to smell it at all. I was told in the comments at PATSP that the smell gets stronger at night; I didn't notice that personally, but the flower was a fair distance away from the bedroom, so. My plants have been outside when they bloomed, and the smell was strong enough to notice, but not so much that I moved it off the veranda, let alone buried it in the garden. I did move a plant to the end of the veranda away from the door, however- because there were flies, and I didn't want them getting into the house. Sounds like Stapelia likes your year-round sunroom spa better than the porch-and-garage life that mine live. I'd be a little concerned too. Do keep us updated on how this turns out for you. Don't be scared Carol. Unless you are scent sensitive I don't think you will have that garbage smell invading your whole home. What a treat having six buds. I had one of these for several years and it only bloomed one time with one bloom for me before its demise. It must be your sunroom giving it such good conditions. I don't remember any smell either but it was outside when it bloomed. I did see flies flock to it. It will be fun to hear the results. So, how is this plant related to our Night-blooming Ceriuses? Or is it Ceriusi? 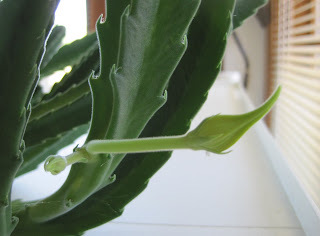 Mine may be blooming right now - I have a little bud on it, too, but I'm not sure if it's ready to open yet. Let us know about the scent, or the stench, as the case may be! I had a friend with lots of them... One year he smelled something rotten, and figure the cat must have brought in a dead mouse. He spent a day searching for it, only to finally notice the flower. They are freakishly cool looking though. I've never heard of this plant and am so curious to come back to your blog when it does bloom to find out if it really smells as bad as everyone says. hope the flowers are pretty! I'm as excited as you are! Annie game me a cutting from the same stapelia 2 years ago. It also has 2 flowers- about to bloom any day. I don't even remember what color it is supposed to be but I saw some in bloom last year at the Wallace Desert garden and they were gorgeous. I'll be watching out for your bloom. Watch out for mine. I love strange and/or exotic plants. Carol, we had one of those in our sun porch and waited excitedly as it begin to blossom. I don't remember the smell being that bad; I think you have to get close to the blossom to get the full impact. It's an interesting plant but it died as along with all other succulents, it's tender and I left it out one day too long. that is tooo funny :) With six buds it could be that the odor could drive you to hide the pot in the basement... where the smell might be better explainable. hopefully you will have one without odor. I had one with a maroon flower that didn't smell. The flowers are so interesting because as the petals unfurl they go backward and end up in a curl unless they run into something, then they wrap around it.